These fudgy no-bake brownies are easy to make and full of wholesome ingredients. Easily customizable and free of gluten, grains, dairy, and refined sugar (depending on which ganache you use). Brownies are my weakness, especially the ooey, gooey, fudgy ones, which I always enjoy with a tall glass of ice-cold almond milk! What I love about these, is that they’re no-bake and full of wholesome ingredients, yet still indulgent and delicious. You can leave them plain or top with your favorite flavors. Speaking of which, freeze dried berries are my new favorite thing! Love that you can get that delicious berry flavor anytime, no matter what season you’re in…plus they just add the prettiest pop of color! The brownie mixture is practically 3 ingredients, not including salt and water. It’s super simple to whip up too, just blend it together in the food processor and you have instant brownies! I love the addition of the creamy ganache too, because HELLO, chocolate on chocolate is the bomb, plus it totally adds to that fudge factor that many of us can’t get enough of. If you are a serious brownie fan, like myself, you must try these wholesome brownies! They’re perfectly rich & chocolatey, and oh, so yummy! I hope you enjoy them! These no-bake brownies are easy to make and full of wholesome ingredients. Easily customizable and free of gluten, grains, dairy, and refined sugar (depending on which ganache you use). Combine walnuts and dates in a food processor and blend until mixture is crumbly and no large pieces remain. Add cocoa powder and pinch of salt, blending just until incorporated. Add coffee/water 1 tablespoon at a time, adding just enough to make mixture hold together when pressed. Line a 8x8 pan with parchment paper and press chocolate mixture evenly into the pan. You can use the flat bottom of a glass or measuring cup to press it firmly into the pan. Set aside. Pour ganache over the top of the brownies in the pan and use an off-set spatula to spread across evenly. Top with toppings of your choice or leave plain, cover, and place into the fridge for 25-30 minutes or until ganache is set. Remove brownies from the pan using the parchment paper and slice. Serve at room temperature. Store leftovers in an airtight container in the fridge for up to a week. No bake chocolate brownies turned out beautifully and are squares of fudge, yumminess! Have been feeling so deprived on a strict autoimmune elimination diet with no dairy, almonds, soya, gluten and and… These have cheered me up no end. Thank you. Oh my gosh, Joscelyn, these brownies look amazing, my mouth is watering, just thinking of grabbing a piece of this brownie! Pinned it……. Joscelyn these look PERFECT! So rich and fudgy—- I just want to grab one right through the screen! Oh my gawsh these look so good. I totally need to have one, like now! My mouth is watering! Wow! Do these sound good! I love brownies even more when they have walnuts in them. Wow! These look so yummy AND they’re vegan! 😀 Can’t wait to make them! 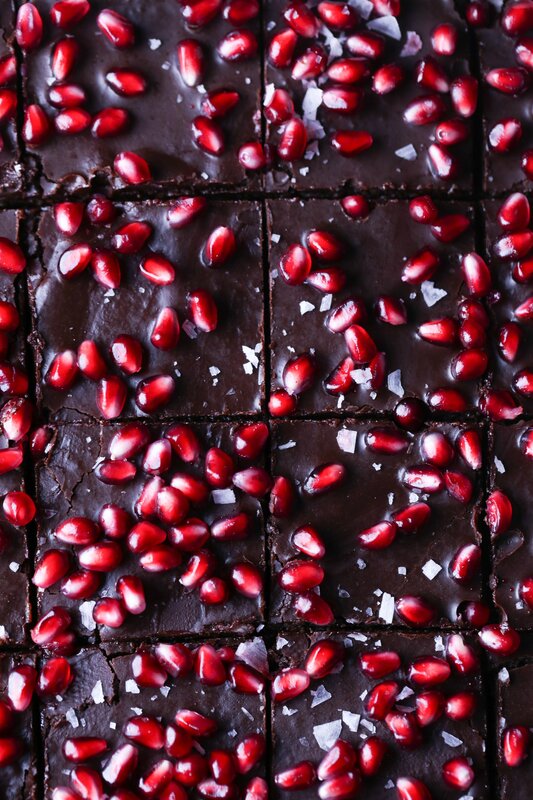 Wow I’m DEFINITELY giving these brownies a try soon. I love that they are ooey gooey, but still good for you. And the pictures look de-lish. Thank you Rebecca. Please let me know how you like them! Thanks for taking the time to send some encouragement. Have a wonderful, lovely weekend! I needed a reason to put my food processor to use and these look amazing! I can hardly believe these are no bake brownies. They look like the “real deal brownie” . . .only fudgier. Definitely going to have to give these beauties a try. Wow do these ever look delicious. Oh soft, gooey delicious chocolate. You have decorated these extremely well. Thank you so much for the encouragement, Candy. I really tried to make this as delicious as it looks 🙂 Have a lovely day! How did you know my Friday needed some chocolate?! 😉 These brownies are perfection, and I’m obsessed with that ganache topping! These. Look. Delicious. I need them right now! Haha, yes, they’re as delicious as they look! Thank you for stopping by! Aw, thank you Emmy! I hope you’re having a great weekend! These look so yummy and perfect for Valentines Day! !